Luxury yacht AQUARIUS was one of the most anticipated launches of 2016, holding true to the quintessential Feadship values of performance, efficiency and beauty. Designed by Sinot Yacht Design, with accommodation spreading over 6 luxury cabins for up to 12 guests, Aquarius might be simple in her styling and guests might have to look twice to notice the subtle details within her 'less is more' philosophy, yet amenities are not lacking: A swimming pool, sundeck Jacuzzi, helipad, cinema and beach club spa are among the lavish indulgences awaiting the owners and anyone lucky enough to spend some time onboard. Simple in her styling, guests might have to look twice to notice the subtle details within her 'less is more' philosophy, yet amenities are not lacking: A swimming pool, sundeck Jacuzzi, helipad, cinema and beach club spa are among the lavish indulgences awaiting the owners and anyone lucky enough to book her when she's available for charter. See her in action and take a closer look at her layouts. 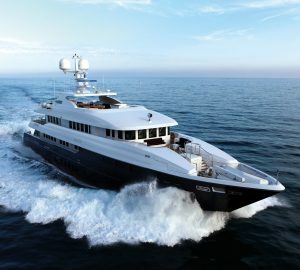 Feadship in-house designer De Voogt created her naval architecture and the interior and exterior appearance were completed by Sinot Exclusive Yacht Design. The result is a unified theme running from one guest area to the next, characterised in pristine white furnishings and bold colour accents. The minimalist ethos is most noticeable in the open-plan main salon, where the emphasis is placed upon guest space and comfort. Brilliant white interiors contrast against the deep blue of the formal dining table and the salon arm chairs. The chequered ceiling provides plenty of recesses to conceal the lighting, which was an important element in the interior design of luxury yacht AQUARIUS. While on the move, cooling off and exercising is a breeze in the large swimming pool on the main deck aft. After working up an appetite guests can dine alfresco in the shade before taking to one of the sun loungers for a well-earned rest. With the crew quarters placed on the lower deck, the guest suites benefit from an elevated position in the bow of the main deck: Expansive windows flood the cabins with natural light and each comes equipped with en-suite facilities. 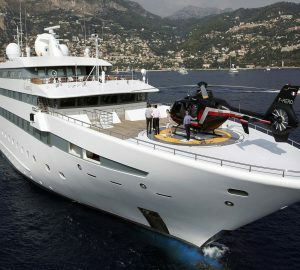 The beach club aboard luxury yacht AQUARIUS has plenty of gym equipment and is entered via a terrace in the starboard side of the hull. Further forward, the large tender garage stores a huge variety of water toys and bulwarks to either side of the garage open up for easy deployment and retrieval. Guests will find the hub for alfresco dining on the upper deck aft: The table runs along the length of the deck area to seat 12 guests free from windy and rainy conditions due to the transparent pull-down screens covering the port and starboard sides. 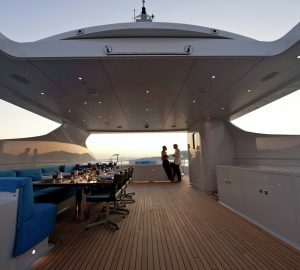 LED lighting illuminates the area after sundown, leaving guests to enjoy an evening of conversation at one of the elliptical sofas close to the dining area, or nestled into the seating along the stern. When hosting a large dockside party, the upper deck skylounge bar will be a favourite haunt for guests looking for refreshments while circulating between the indoor and outdoor salons. 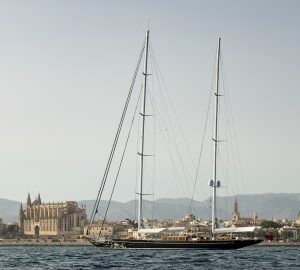 The clear foredeck also doubles as a helideck and revellers have the benefit of arriving straight into the celebrations. The crisp white Owner's deck is a private floor that places the generous suite to the aft fitted with his and hers walk-in wardrobes and en-suite bathrooms. Forward of the lobby, there is a lounge that functions just as well as an office/study, brilliantly lit and benefiting from sweeping forward views. The Owner's suite also comprises a large exterior deck space furnished for sheltered lounging and dining and guests can doze in the warmth on the double-sized sunpads. The spacious sundeck aft offers sheltered lounging and alfresco dining under the hardtop overhang. 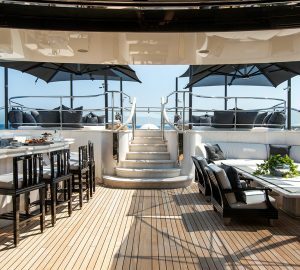 A table and couple of chairs are placed in the port and starboard corners for rest and private conversation, leaving the majority of the space free for entertaining. 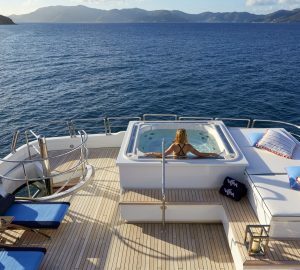 The sundeck forward creates a more private environment where guests can marvel at the views while soaking in the Jacuzzi, resting on the sunpads or chatting on the curved sofa. Powered by twin MTU 16V 4000 M63L diesel engines, luxury yacht AQUARIUS is capable of a top speed of 17 knots. 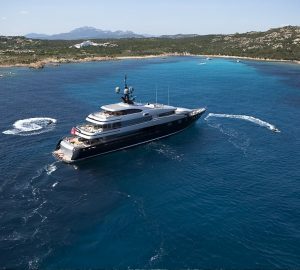 Perfectly suited to long-range cruising, she can travel for 5,500 nautical miles at a cruising speed of 12 knots. Superyacht AQUARIUS is an exceptional entertainment venue that combines the best modern design practices to amplify the beauty of the sea. 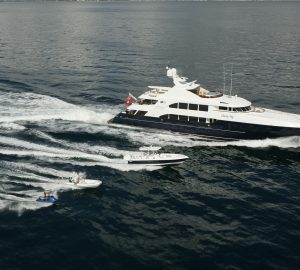 The selection of high-speed water toys brings everyone the opportunity to explore the surroundings, and the range of activities on board will easily pack a week or two of adventure in the sun without ever stepping a foot onto dry land.